Newsletter, May 2017. An update on what we've been up to, and some upcoming events you might be interested in. The day after MEG decided to join in protests at Westpac branches over their coal funding policy, Westpac announced a new policy that they would not invest in new coal basin developments - so the protests are cancelled! QLD Nationals Senator and leading light Matt Canavan, who apparently never saw a coalmine he didn't like, responded that “It seems to me that some corporations unfortunately are wimps when it comes to standing up to the activists”. We like the sound of that! This is an important step in the campaign, although we haven't won yet, with the Federal government still promising a billion dollars of taxpayers' money in subsidies to Adani's Carmichael coal mega-mine in western Queensland. The mine is scheduled to begin construction in August. If you're on facebook, "like" us and share our posts to help get our message out to a broader audience. Please share this newsletter. Pass it on to friends in and around Moorabool shire. If you received this from a friend, you can subscribe directly from our website. Has your baby tried cloth nappies? 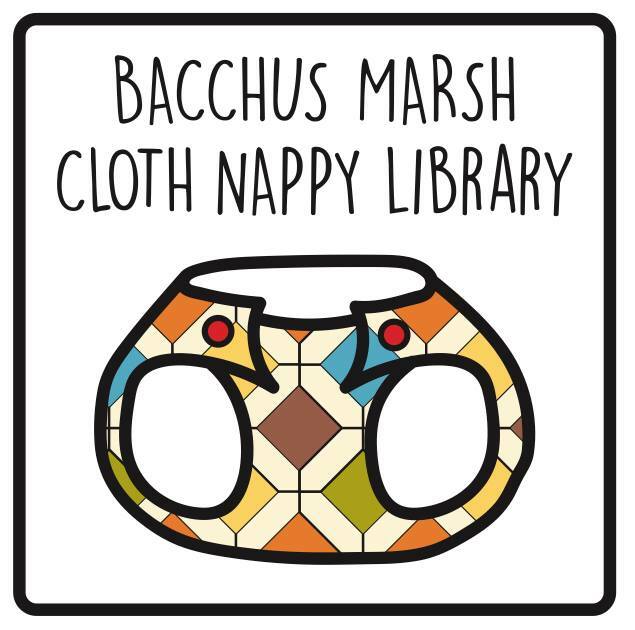 The Bacchus Marsh Cloth Nappy library has now been operating for over a year and is going very successfully. It's a FREE service for families who are interested in trying Cloth Nappies but not quite sure where to start. The modern cloth nappy is funky, easy to use and can save thousands of dollars not to mention significantly reducing the environmental impact of using disposable nappies. For more info, check out the MEG website or the Bacchus Marsh Cloth Nappy Library Facebook page for more information. MEG member Mara was concerned last year when the REDcycle plastic packaging recycling bin dis-appeared from out the front of Coles in the plaza at Bacchus Marsh. After a few pointed letters to Coles management, the bin was returned to its position! Thanks Mara. Soft plastic packaging (plastic bags etc) can be left and is recycled into plastic boards to make park benches and the like. You can check online if there's a REDcycle bin near you (and what is acceptable to put in it). Moorabool council is currently consulting with the community about allocating large areas at Parwan, Merrimu and/or Hopetoun Park for new suburban development after currently zoned areas in the Marsh are filled up. In other proposals, council is suggesting somewhere in the area between Geelong Rd and Merrimu that a new truck bypass be put in (exact route to be determined); and an area of land adjacent to Geelong Rd near the airfield is to be zoned as a new industrial estate. Residents in these areas, including MEG members, are engaging robustly with the process to try and make sure that if we do get Melbourne's growth spilling over into the shire even more, that it's done in the best way possible. If you missed the council's initial consultations with the community, feel free to get in touch with MEG and we'll put you in touch with other local residents so your voice is heard. 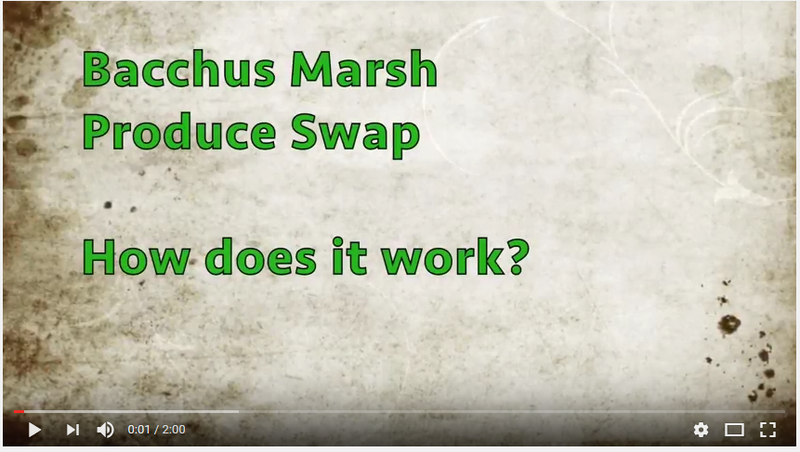 The Bacchus Marsh produce swap happens on the first Saturday of every month at the Darley Community Art Garden. What is it all about? Well we now have this excellent video to explain! Once you have watched it, come along with your excess garden produce to meet, chat and swap! You may have missed the news, but over Easter, fires broke out twice at an indoor coal stockpile in the industrial estate at Rowsley Rd south of Bacchus marsh. A large CFA contingent attended to put the fires out. We don't know much more than that at this stage, but will try to keep everyone informed of concerning events like this. After years in planning limbo, it appears our shire's three wind farms are set to go. GoldWind Australia have bought the Moorabool Wind Farm project from WestWind Energy, who did the planning work for it. Construction is expected to start in early 2018. Meanwhile, WestWind's Lal Lal wind farm project won its application to amend their planning permit and use fewer, but larger and more up-to-date turbines. Lastly, the Yaloak wind farm is also going ahead. Here's a map of where wind farms are built or being developed in the state. Ballarat council just made it policy to achieve carbon neutrality by 2025, adopting a motion put by councillor Belinda Coates by a margin of 2-1. Will Moorabool join in this sensible ambition? MEG meetings are at 7:30pm on the last Thursday of the month, alternating between Ballan (In the back room of the Commercial Hotel) and Bacchus Marsh (in the Lerderderg Library). Next meeting (May) is at Ballan. All supporters welcome to join us! We are currently working on a reachout effort to take to local markets and the like; organising MEG social events; and the campaigns and issues above if you want to be more involved. Email us for more information. Friends of Werribee Gorge and Long Forest Mallee are making a big effort to plant an old, until now weedy paddock next to the carpark at Meikles Point in Werribee Gorge. Meet Saturday 20 May and Sat 24 June, 9:30am at Meikles Point carpark, wear appropriate work clothes, and bring lunch and water. Tools provided, or BYO if you have favourites! Myrniong Primary will also be planting the area on Friday June 23. For more info, contact co-ordinator Bob Reid on 5367 2462 or mobile 0427 564 021. Film Screening: Stop Adani! As mentioned above, MEG will be screening this in Bacchus Marsh on the evening of June 22. Please come along to see the film, ask questions, and find out how you can get involved. We'll send a separate email with the exact details of time & venue. Grow West tree planting day: This year's big tree planting day is July 16 at Telford Park, in Darley (Bacchus Marsh). Save the day! Information will be available at growwest.com.au. We have probably missed events! Let us know if you want your group's events added to future calendars.